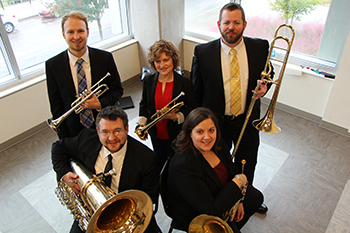 The Natalie L. Haslam Music Center at the University of Tennessee-Knoxville is home to an outstanding brass faculty who together provide enriching and comprehensive guidance toward professional brass performance and teaching. Housed in brand-new, state of the art facilities which provide ample practice and performance spaces, students in the brass studies programs are challenged to succeed in a great variety of ways. Excellent student ensembles and diverse performance opportunities, faculty and guest artist recitals, and world-class brass studio curricula are just the beginning of the complete and rewarding education in brass found at UT. Undergraduate programs of study within the brass area include Bachelor of Music degrees in a variety of concentrations, including Performance, Music Education, Theory/Composition, Studio Music/Jazz, and Scared Music. In addition, a Bachelor of Arts is offered with potential concentrations in Applied Music as well as Music and Culture. For graduate students applying to a brass studio, a Master of Music in Performance, Composition, Instrumental Conducting, Jazz Studies, Music Education, Music Theory, and Musicology is offered, and Graduate Teaching Assistantships may be available. Students who are not majoring in music can also apply and audition for a Music Minor, with concentration areas in Applied Music, Music and Culture, Music Theory, Music Composition, and Music Business. The superb quality of our graduating brass students reflects the highly renowned faculty who oversee the program. Our professors have an extremely wide breadth of performance experiences, and they take pride in sharing those experiences with their students. Our faculty include Dr. Cathy Leach, trumpet, Dr. Katie Johnson-Webb, horn, Dr. Alex van Duuren, trombone, and Dr. Alex Lapins, tuba/euphonium. Check our calendar for opportunities to come meet with us and hear us play! We look forward to seeing you at the University of Tennessee.